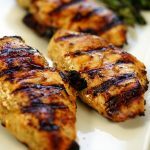 It's time to get your grill on with a savory and tasty Lemon Pepper Marinade. It's easy to make at home and tastes so much better than store bought. Made from fresh ingredients you have on-hand it's perfect for grilling season. Mince the garlic, parsley and dill. Add these ingredients to a jar or a ziplock bag. Add the remaining ingredients and whisk or mix together well.